This week we were able to check out a few books that other Moms have posted on Feed Me Books Friday in the past and I wanted to share those again because K has absolutely loved them! I just wish I could remember who recommended these so I could thank them personally! If you did, please let me know! “My Crayons Talk” is a cute little book about different colors of crayons and what they might say. While reading this, we used letters from the game Bananagrams to spell out some key words to help K recognize them better. He is so entranced by this book! 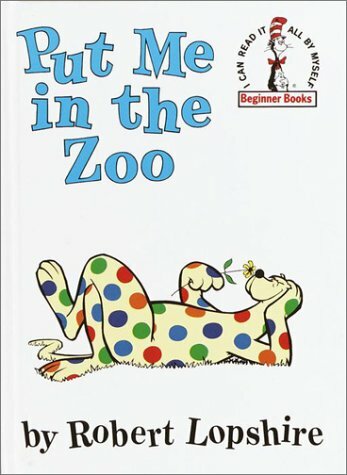 Dr. Seuss does it again with “Put Me in the Zoo.” I am baffled by how clever he was because this book is so funny! A spotted animal wants to live in the zoo and proves to some kids how talented he is by changing his spots. K thinks it’s hilarious and has the best comments for each spot transformation. For more Feed Me Books Friday, head over to The Adventure of Motherhood! PS The links on the books are just links to images so it would be easy to tell which book I was talking about since it’s hard to see in the photos. I love PUT ME IN THE ZOO! My Grandmother used to read that to us all the time! I'm giving away a copy of the book I featured in my FMBF post...stop by if you'd like to enter! I like the idea of having your son spell key words with Banangrams! I'm also having a fun giveaway ending Sunday on my blog: http://milknhoneylearnandgrow.blogspot.com/2010/05/book-review-birds-by-books-by-tara.html. Have a great day! I know! I've thought about making a thank you post for all the bks FMBF people have rec. and we loved. It really works. I didn't use my list much this week and I regret it. Our books have been dull and cooky.